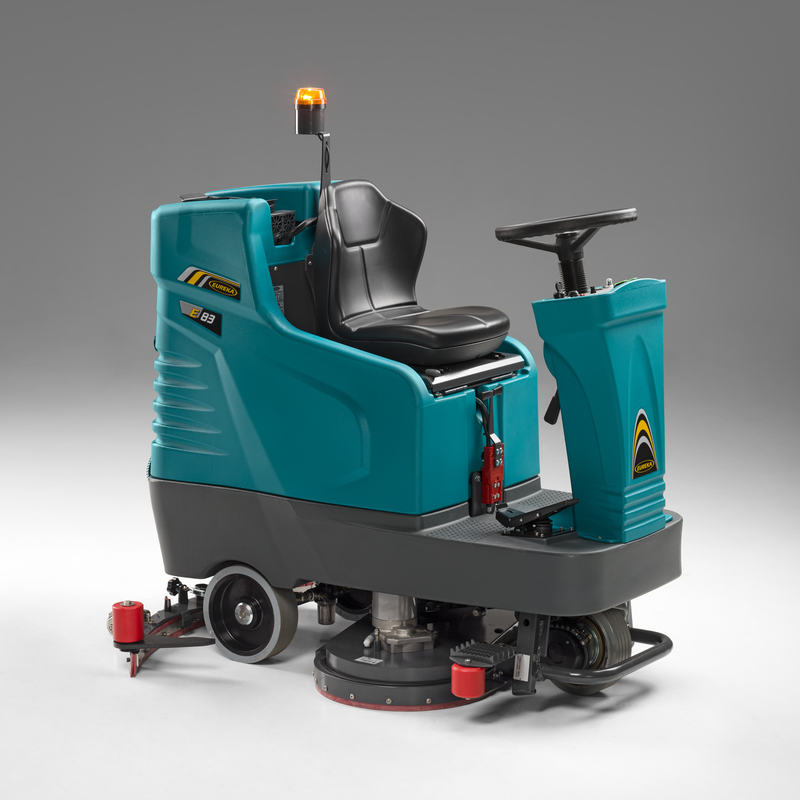 The E65, E75 and E83 are three new ride-on scrubber-dryers designed by Eureka to dramatically reduce the cost of cleaning of areas up to 8.000 m². WHAT MAKES THE E65/E75/E83 SCRUBBER-DRYERS SAFE TO USE & RELIABLE? The E65/E75/E83 scrubber-dryers offer the standard Eureka security features such as: reverse speed beeper, claxon, anti-tilt bars, front and rear lights, warning light, low centre of gravity for better stability, total visisbility and water level sensor. What is more the traction motor with electric braking system is completely sealed and protected by a reinforced bumper. The E65/E75/E83 range operates at a very low noise level, making it ideal for noise sensitive environments such as schools, hospitals and nursing homes. HOW WELL DO THE E65/E75/E83 SCRUBBER-DRYERS PERFORM? Impressive vacuum power and large capacity tanks mean the E65/75/83 range consistently delivers a high performance. The 110 L solution tank and 125 L recovery tank boost operating time and energy optimization technology enables the E65/E75 and E83 to clean for up to 4 continous hours. WHY ARE E65/E75/E83 SCRUBBER-DRYERS SUITABLE FOR CLEANING CONTRACTORS? E65/E75/E83 scrubber-dryers are suitable for being used by everybody on all surfaces. However they are particularly well adapated the janitorial sector and cleaning contractors for the following reasons: an extremely competitive price, a full set of standard cleaning accessories, reduced energy consumption and lower costs. In addition the E65/E75/E83 scrubber-dryers compact size is perfect for daily use, especially in extremely busy environments. The machines are easy to transport and can fit through traditional doors and into lifts. 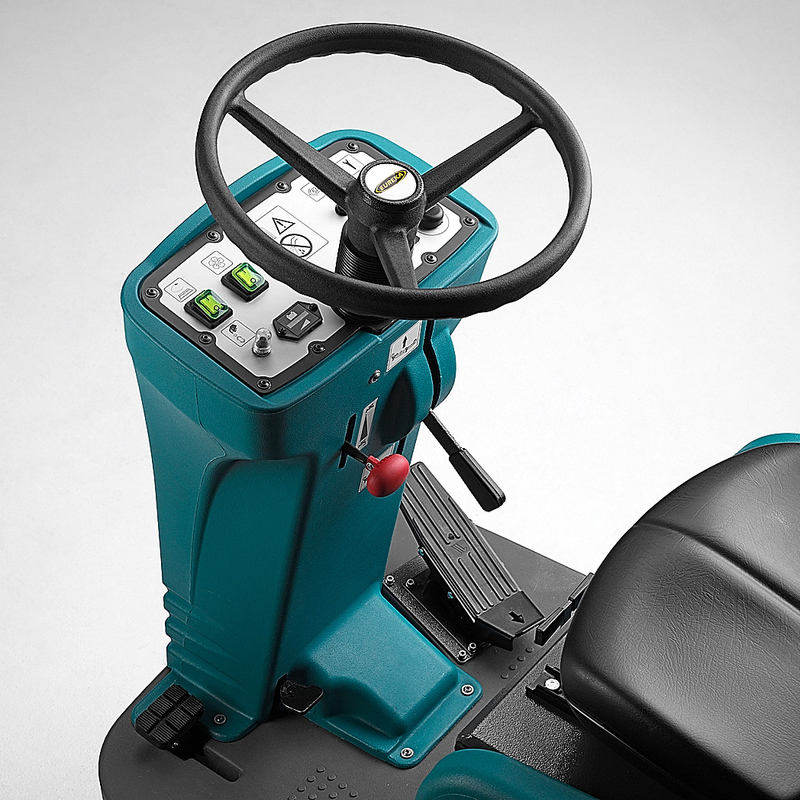 Last but not least the easy and intuitive controls and high maneuverability ensure complete user-friendliness and reduce costs assocaited with operator training. HOW EASY ARE THE E65/E75/E83 SCRUBBER-DRYERS TO MAINTAIN? Eureka S.p.A. has designed the E65/E75/E83 scrubber-dryer range to be efficient and manageable. The stainless steel basket, rapid positioning and changing of the brush heads, easy access batteries and tanks ensure maintenance is quick and easy. HOW BIG ARE THE E65/E75/E83 TANKS? The E65/E75/E83 scrubber-dryer range has high capacity tanks. The solution tank which is filled with water and chemical is 110 liters while the recovery tank is 125 liters. This increases productivity and optimizes operator efficiency. WHAT IS THE E75 SCRUBBER-DRYER CLEANING CAPACITY? The E75 cleaning capacity is 4.560 m2/h thanks to a cleaning path of 760 mm and a forward speed of 6 km/h. WHAT IS THE E83 SCRUBBER-DRYER CLEANING CAPACITY? The E83 cleaning capacity is 4.980 m2/h thanks to a cleaning path of 830 mm and a forward speed of 6 km/h. The E65, E75 and E83 walk behind tanks are made of high-density polyethylene (HDPE) which is incredibly robust, however hot water may cause misshaping. Eureka S.p.A. therefore advises the use of cold water in all our scrubber-dryer tanks. WHAT IS THE E65 SCRUBBER-DRYER CLEANING CAPACITY? 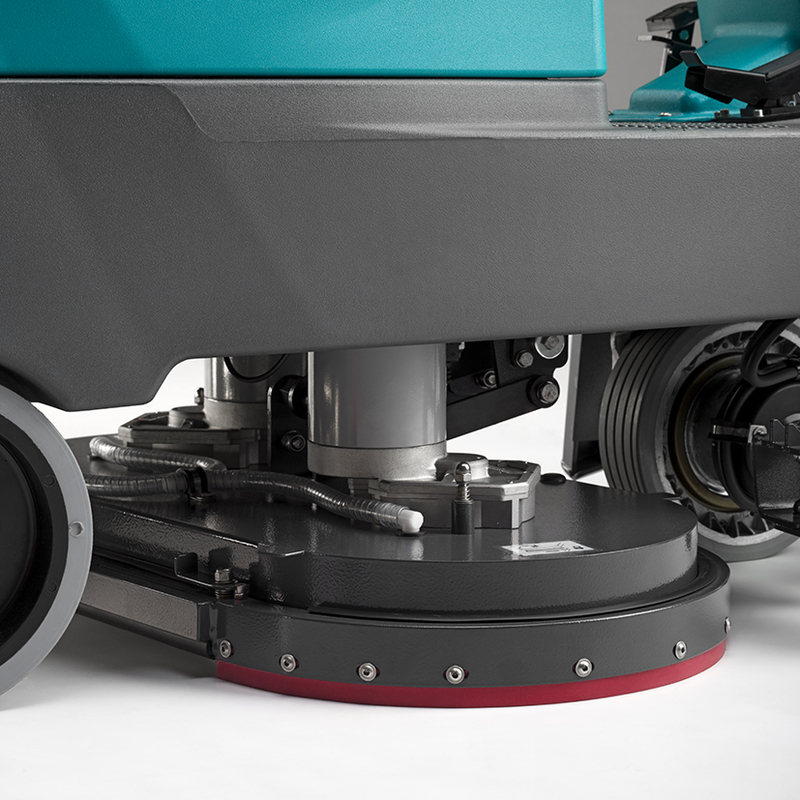 The E65 cleaning capacity is 3.900 m2/h thanks to a cleaning path of 650 mm and a forward speed of 6 km/h. Our objective was to create a compact range of machines, that were fast and productive, and could be purchased at a very competitive price. The E65, E75 and E83 are modern alternatives to bulky walk-behind or oversized ride-on scrubber-dryers. The range is equipped with innovative technology that optimises energy consumption and boosts working time up to four non-stop hours, reducing the cost of cleaning and increasing productivity. Each version has it's own unique twin head scrub deck with a cleaning path of 65cm, 75cm or 83cm. The compact size allows operators to easily navigate congested areas and the machines can even pass through traditional doors or be transported in lifts. Intuitive operation means no more time or cost is spent on operator training, the range is very simple to use and fitted with user-friendly controls. The E65/75/83 range guarantees a dramatic reduction in the cost of cleaning, thanks to an extremely competitive purchase price and a complete set of standard equipment, which reduce waste and consumption. The recovery tank is equipped as standard with a stainless steel basket to avoid larger debris entering and potentially clogging the system. The E65, E75 and E83 ride-on scrubber-dryers are ideal for noise sensitive environements, equipped with a powerful vacuum motor that is silenced and operates at a low noise level. The E65, E75, E83 are equipped with high capacity tanks for increased productivity, the solution tank is 110 L, while the recovery tank is 125 L.
Energy optimization technology boosts operation time to an impressive four, non-stop working hours. The squeege uncouples on impact, preventing damage to the machine or the environment. The floating skirt adjusts to the surface, preventing unwanted splashing and solution-leaking whilst cleaning. The E65, E75 and E83 are equipped with intuitive, user-friendly controls, for simple operation without needing training. The drive motor is completely sealed and protected by a reinforced bumper. The machine is also equipped with an anti-tilt device for increased safety. The E65, E75 and E83 are also available with the Chrome upgrade, with frame, scrub deck and drying system in stainless steel to deliver resistance in corrosive contexts.